Finally! "Nightmares of Murder" is being printed now! It will be available on Amazon in February! I had the great privilege to be able to attend the homegoing service of Sister Willa Dorsey. They allowed friends to have a few words, and we heard from people all over the world who loved her, whose lives she touched, from the soldier who was stationed in Germany, to the leader of the Portland Salvation Army Band, to one of the musicians from the Lawrence Welk show, to ordinary people who loved her. We learned that she called a lot of people ‘Baby,’ even though each of us thought we were the only one! We sang some of the songs she sang, including “Welcome Table” and “Oh, I Want to See Him,” which were particularly touching when we realized that she is now seated at the Welcome Table, and on the streets of glory, she is now lifting her voice, and looking upon His face. The best part was after the preacher had brought the message, when he gave the invitation to Christ - at least 3 people accepted Jesus! So even in her death, she still is pointing souls to Calvary! Oh, yes, I miss her, but even if she could come back to earth, she would never leave her eternal home in glory! 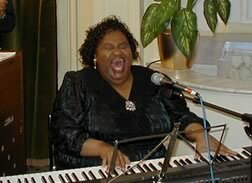 Sister Willa Dorsey CDs can be ordered online at the Everlasting Online Bookstore. We just got back into town after 2 weeks in the snow!!! HAPPY NEW YEAR!